More signs that new iPad Pro models are on the way have surfaced, with an app analytics platform claiming to see logs of model identifiers for unreleased models for the tablet, labels that seemingly correlate with other rumors about the 2018 refresh. Renders of new iPad Pros, allegedly based on leaked CAD images. Mobile analytics firm Appsee claims the model identifiers "iPad8,1," "iPad8,2," "iPad8,3," "iPad8,4," "iPad8,5," and "iPad8,8" have recently started to appear on its platform. The identifiers first surfaced on Monday, with the identifiers in the latest report joined by two other labels, namely the missing two from the set: "iPad8,6" and "iPad8,7"
Appsee has yet to spot any references to "iPad8,6" or "iPad8,7" in its logs, but it is likely that the models still exist, if not being used in a way that it could be seen by third-party analytics systems. The logs also suggest there are two different resolutions of iPad Pro display in use, and that they are the same as the existing 10.5-inch and 12.9-inch models. While the logs indicate the potential resolution, it isn't able to determine the physical dimensions of each device, which rumors suggest could have a similar screen size but with a smaller bezel, resulting in an overall reduction in size, or for the 10.5-inch model to have a bigger 11-inch screen while staying physically similar to its predecessor. The lower four model identifiers apparently have the resolution of 1,112 by 834 points and the upper two have 1,366 by 1,024 points. As the iPad Pro use a high-resolution @2x modifier, MacRumors reports, the actual resolutions are doubled, resulting in 2,224 by 1,668 and 2,732 by 2,048 respectively. The figures also suggest the screens will have the same 4:3 aspect ratios as the current models, despite any potential changes in size. Rumors suggest the 2018 iPad Pro will use Face ID instead of the Home Button, borrowing the concept used in the iPhone XS. Rather than using the notch aesthetic, the tablets are likely to insert the TrueDepth camera system into the bezel. It is also rumored the new models will be capable of supporting 4K HDR output to external displays and TVs, using an integrated USB-C port. A new Settings panel will apparently enable control over the outputted resolution, brightness, and enabling and disabling HDR. Other rumors have hinted at Apple replacing Lightning with USB-C to support higher bandwidth applications. There is also the suggestion the Smart Connector will be replaced by a new "Magnetic Connector, repositioned to the rear and close to the base of the device. The new connector could support new accessories beyond the usual keyboard, though what these could be remain unknown. Apple is expected to announce a new slate of iPad Pro models at a special event later this month. Check out AppleInsider's analysis of the presumed October event for more details. On these new models the notch will rotate with the screen orientation, so you always have one centered in the top middle of your screen. Maybe it’s just me, but I see no point to the notch coming to iPads. Achieving the same screen to body ratio on the iPad as the iPhones should allow enough bezel to shove the camera and other stuff into the screen. They are also a 4:3 ratio not needing a weird ratio like the iPhone. Yeah, I don’t think you have to worry about that. Pretty much 100% of the rumors are suggesting there won’t be a notch on the next iPad pros. The thinner bezels will be large enough to House the face ID cameras. There is no guarantee that all those models will ship. There could just be four. Making 6 model numbers. The missing two model numbers could have been a model that never made it passed EVT. Then, they could decide not to ship either the 10.5 or the 11 pending how they feel which on is the better product. Or it could be that they use different ID. Good thing is that model numbers with “8,x” likely means either A11X, A12 or A12X SoCs. Needs 5G support and storage capacity that STARTS at 256gig (256, 500 & 1TB). Those 4K video's are HUGE. 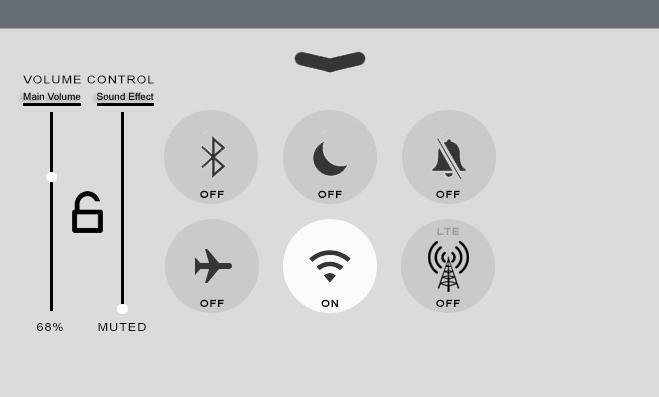 From an OS standpoint, needs to add on/off to the quick tools for Cellular (like it already had for turning Wifi on/off).. big pet peeve for cellular models is lacking that feature there, so that you dont have to go into the Settings screen to turn it on/off. I even drafted a proof of concept (albeit based on the former screen iOS use to use -- I added the Cellular tower with an added concept of lighting up the LTE if connected to a LTE signal and ON/OFF labels under each to help enhance telling you its on or off (which might seem redundant at first, but its actually more intuitive info to include). My 2cents, but those are the new changes that would make me want to buy a new one on day 1. Still no new mac model numbers. Sigh. As the owner of an LTE iPad Pro 12.9”, what I would like to see is the ability to take handwriting and convert it to digital text. I agree, but it's odd that the iOS 12 update moved my top center clock off to the left side of the screen. Now maybe they're just trying to unify the screen info across all devices, but iOS 12 didn't bring that change to my notch-less SE. So if the new iPads don’t have a headphone jack what will Apple’s explanation be for it? That people don’t use wired headphones anymore? I can’t imagine there’s a space issue inside the device. There is also the suggestion the Smart Connector will be replaced by a new "Magnetic Connector, repositioned to the rear and close to the base of the device. Suggesting keyboards that use the smart connector will need to be used in portrait orientation. And Bluetooth only keyboards for landscape. You are talking about one of the most financially greedy corporations in the world. The 11” iPad will start at $999, possibly more. Sad statement... but likely true. Hope I’m wrong because I’m trying to fix my uncle up with an iPad Pro and wish for him to hold out for the 11”, 256 GB model. I hope he can afford it, but it looks like that won’t be the case. If the rumored thickness of 5.86 mm and bezel width of about 7 mm is true, it means the new form factor isn’t thick enough for an audio port housing without making a bump. The LCD will be something like 1.5 to 2 mm thick, the casing will be about 1 mm and you’ll need 4 to 5 mm for the housing, which makes about 6 to 7 mm. Not enough thickness if it is 5.86 mm. But that isn’t material to the reason for not having it. They want to move to wireless headphones. Best way is to do that is a forced March. If it has a USBC port (I’m really hoping for TB3 myself) instead of Lightning, hmm, wonder if they’ll have a USBC to female Lightning port cable available? There USBC to 3.5 mm port cables already available from other vendors. We will see if it's actually too thin to accommodate the 3.5mm jack. They literally have 2.36mm space to spare if 5.86mm is correct. Moving to wireless is all well and good, but an iPad is used for some serious audio work, and will need a wired audio connection. Obviously the Lightning adapter will work for that purpose, but my money is on this new alleged Smart Connector, which could easily handle the needs of analogue audio, not to mention USB 2.0. That would leave the Lightning port open. They might surprise us with USB-C, but I seriously doubt it. It’s not 2.36 mm to spare, it is 2.36 mm to fit the back casing, the port housing, the display and the display glass. The iPod nano 7th gen is perhaps the thinnest you can go at 5.33 mm. If so, that’ll leave 0.5 mm to fit an LCD display, and last I saw, those were 1.5 to 2 mm or more. I don’t think OLED can get to less than 1 mm, and they are more at around 1.5 mm. As far as audio work, it’s forced migration to USBC, assuming the 2018 models have USBC, but no audio port. Perhaps iPhone like with only a Lightning port is what it’ll have, plus the new smart connector, but I think that is a net negative versus USBC only. Perhaps the iPod nano is the thinnest possible, perhaps it’s not. USB-C requires a 2.5mm opening, not including the port housing. So we’re still talking about a 1mm difference. You’re saying an LCD display can be 1.5mm. So that’s 5mm with the headphone jack, with almost 1mm to accomodate the casing and port housing, the extra depth can be carved out of the case thickness if necessary. And that’s assuming we really are restricted to 5.86mm. But here’s the rub, if Apple reduced the thickness by .5mm in lieu of leaving the headphone jack, I’d call that a poor exchange. The problem with reducing the iPad to one port, basically makes any serious audio work more problematic, requiring the purchase of additional dongles, and makes it less of a portable, self-contained solution, compared to the MacBook, when the inclusion of a simple port and less than another mm to accomodate it would solve the problem. Who knows, perhaps Apple will introduce low latency technology in their wireless devices, with uncompressed audio. But I doubt it. When will they remove the headphone jack from MacBooks, MacBookAirs and MBPs? When the new iPadPro Comes out you should be able to get the older 10.5 for a little less than current prices - if you don't need FaceId. I have the 2017 iPadPro and its a great tablet. Same weight as the 9.7 from a few years before. Amazing. I don't see a need for another upgrade for years.